I love San Francisco. I do. It seems to be the perfect place for the tech-geek, art admirer, spend-my-days-in-quaint-coffee-shops type of girl, and one with a strong urge to meet diverse and interesting people. I am sitting here at a hip coffee shop in Nob Hill, tipper-tapping away, surrounded by the hustle and bustle of people on a beautiful Saturday afternoon. It is sunny and a beautiful 28 degrees. Say what? You thought San Francisco was always foggy and a bit dreary? On occasion yes, but this time of year, it has been blessed with good weather – a late summer or what they call an ‘indie summer’. Regardless of the weather and fog, San Francisco is a city always bursting with culture, events and really, really good food. I’m taking a sip from my organic, mint, chocolate, iced-mocha and glance up. A cute male has set up camp with his laptop on the rustic wooden bench next to me. I converse with him on the weather and ask him why he isn’t soaking up the Vitamin D outside – he’s got a big pitch to prepare for his startup company on Monday and we begin delving into his story of how he quit his well-paying corporate office-job to pursue his dreams. He leaves to meet his angel investors somewhere in the SOMA district (There’s some San Francisco slang – South of Market). I feel inspired now, a rush of motivation sweeps through me as I daydream about the passions in my life I want to pursue… Another cute male specimen, (hazel-eyes), has just settled into the basket-woven armchair adjacent to me. Wow, I am seriously being bombarded by attractive men today. Must be the organicness of this coffee I’m exuding. My iced mocha becomes unappetisingly watered-down as we realise our joint love for jazz and blues. San Francisco is also a city that embraces the gay community – and i have to say the majority of men I’m attracted to (today) happen to be gay. Hazel-eyes and I make plans to go out and experience the Castro (neighborhood known for its gay-community) nightlife and for me to meet his wonderfully eccentric friends. ‘Are they just roaming around in your backyard and streets?’. I’m not sure what others have heard or experienced but it has been hilarious. I’m telling you, I had never heard of, or knew such creatures existed in our land down under. Drop bears? The mash up of koala and beast… And a snail that shoots poisonous venom through its harpoon-like injector? These have actually played an advantage as ice-breakers during class introductions, although the Aussie accent already paves most of your breakages. The classes I’m taking range from 15-30 people – make sure you take advantage of their priority registration that allows you to sign up for classes before most of the other students. I really appreciated this as registration is open to everyone after this and its a cannibalistic mess. Students have tried crashing classes on the first few lessons to no avail, tears have been shed, frustration, bewilderment, pleading, begging etc. It’s not too pretty. But the level of commitment and involvement from professors and students has astounded me. These are hard-working, serious students who are not taking their academic pursuits for granted. It’s pushed me out of my comfort zone to really be active and participate in discussions, share ideas, ask questions and really dedicate myself to group projects. 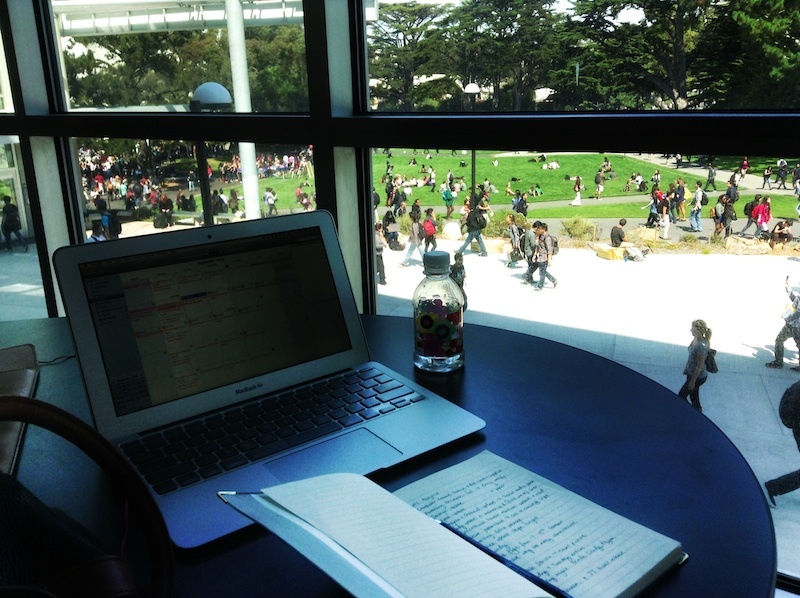 One of my favourite places to study is at the library. The view is beautiful, a real campus feel… there are people everywhere, the place is always bustling, people bask in the sun on the lawn during breaks – the best place to really capture the movement of the student body. That’s the best thing about San Francisco – there is city, nature, beaches, hikes, mountains, wine valleys all in its 49 mile square radius. Next Next post: Welcome to Rotterdam, Netherlands! UTS Global Exchange San Francisco, the cool grey city of love.